The Yahoo! Daily Wire, which was an email newsletter that included Yahoo Picks, New & Notable Sites, Full Coverage and Daily Entertainment news has announced it will stop being delivered via email sometime this month. The notice can be seen below. Let me be one of the first to say thank you Yahoo! for years of great reading. I will miss you. All is not lost, though. Yahoo! Picks will remain available at its web based home as it has been for years. 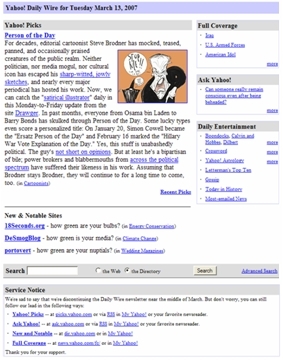 Yahoo’s New and Notable sites will have a new home, front and center at http://dir.yahoo.com/, which is the main entry page for the Yahoo Directory (once upon a time this page was used by everyone). I wont go into the meaning this change signifies in the larger scheme of things. I’ll go into it that deeper in The Ward Report. reading. I will miss you. For fans of the content itself, there is a way you can continue to receive email when these pages change each day. You’ll have to use a third party page tracking service like TrackEngine. You’ll also have to have a Yahoo account. Then, all you do is add these two URLs to your list of pages to track, and make sure you enter your username/password on the TrackEngine Track This Page form. Then, every day, when the Yahoo Picks page and New & Notable section is updated, you get an email showing the changes, highlighted in yellow. It’s a decent if inelegant workaround, but it beats having to remember to go to those two pages everyday. The new email alerts will be your instant reminders that the content is new. Lastly, why would Yahoo! discontinue a service that gave them permission to get in my inbox everyday? More on that later.